If you're not a cat person you may not be aware that cats have an eternal struggle going on with sunbeams. You see, a cat can be chilling around, minding his or her own business and out of nowhere this sunbeam comes along and whammo! - pins 'em right to the ground. When this happens the cat can do nothing for hours, until the sunbeam goes elsewhere. Or it's dinnertime. 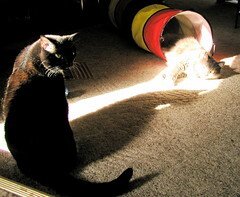 In this photo you can see Heisenberg trapped dually by a cruel sunbeam and his play tunnel. Schrödinger looms in the foreground, indulging in a bit of schadenfreude at Heisenberg's expense.